Open Educational Ideas – Sharing space for open educational ideas. Recommend development tools for textbooks and courses! Sharing space for open educational ideas. Recommend development tools for textbooks and courses! Our project partners at the National Center for Scientific Research ”DEMOKRITOS” are currently preparing the OEI sharing space for open educational ideas for its public launch. It will be web application enabling peer educators to engage and collaborate openly through the entire life cycle of the OER development: From the early idea finding stage until evaluation and improvement of the open educational resource or practice. 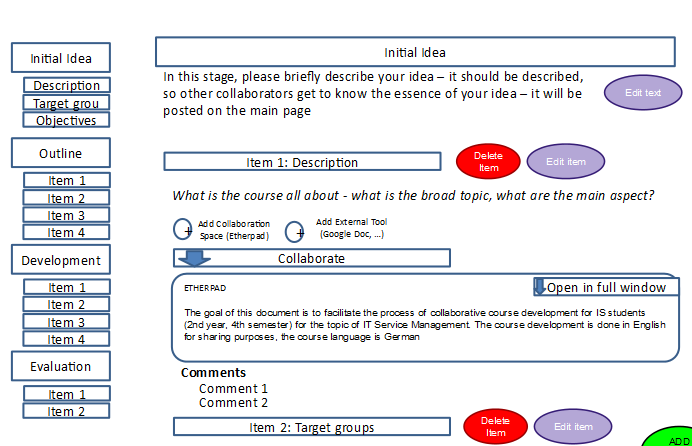 Get guidance by creating workspaces with pre-set stages for open collaboration on textbooks and course development for example. Those templates are based on interviews in which open education experts and newbies reflected on ideal collaboration and support needed to collaborate on an open educational idea. The collaboration space is not aimed at substituting the preferred tools for collaboration among colleagues and network – be it google docs, dropbox or the like – but encouraging to open up work done elsewhere to interested peers and make it easier to join on-going work at different stages. Which tools do you know for open course and textbook development (ideally at no or little cost)? Should we recommend those on the future platform to make it easier to put ideas into reality for open education newbies? Please comment below!